This Thursday, August 31, 2017, at 7:00 p.m. in Camp Jaborandy, located in Tabarre, next to the park of the Unibank, will take place the closing ceremony of the end of operations of the Brazilian battalion and the Brazilian engineering company in Haiti. The two units will cease operations on the following day, September 1, 2017. 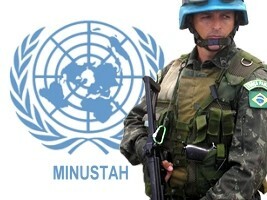 Over the past 13 years, Brazilian troops from the Minustah have conducted security operations, facilitated the peaceful conduct of national elections, and provided humanitarian assistance in the aftermath of numerous natural disasters including the 2010 earthquake and Hurricane Matthew in October 2016. Raúl Jungmann, the Brazilian Minister of Defense, accompanied by a delegation of parliamentarians and senior officers of the Brazilian Army, will attend the event alongside the Special Representative of the Secretary General of the United Nations in Haiti and head of the Minustah Sandra Honoré and the commander of the military component of the Minustah Lieutenant-General Ajax Porto Pinheiro. This ceremony marks one of the last important steps in the context of the withdrawal of the UN Mission on 15 October 2017.